If you’re anything like the millions of other Pinterest users in America, you’ve got a serious pinning problem. Not that we blame you! Where else can you find and collect so many funny, inspiring, educational, and useful bits of information, all in one place? What’s so great about Pinterest, aside from the fact that you can save great scraps of information for later, putting less demand on your time, is the implicit legitimacy of a pin. You know right from the get-go that someone already thinks that pin is valuable or useful, and so in a way, it’s been prescreened for junk. 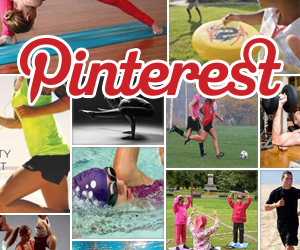 Did you know California Family Fitness has joined the Pinterest craze? We know a good thing when we see it, and it’s easy to appreciate how easy Pinterest has made it to share and collect great ideas from all over the web. We have several boards that we’ve filled up with great information in a variety of health related categories, and it’s all in one convenient place, just waiting to be repinned. In case you need any more reason to follow us on Pinterest, check out the top 9 reasons you should be stalking Cal Fit’s Pinterest boards. Get Motivated. Let’s be honest, not every day starts with a smile and a burning desire to get down to the business of calorie burning. Being fit takes dedication and drive, which can wane from time to time. Combat mental fatigue and lagging ambition by browsing through our “motivation” board, and repinning a few inspirational quotes or pictures. Simply looking at positive messages can reset your mental switch, and get you moving with renewed purpose. Keep your workout fresh. It’s hard to keep your routine fresh. We are, after all, creatures of habit. But you can easily find fantastic ideas for workouts to try, the latest in exercise science information, and even great outdoor exercise ideas for the whole family, all on Cal Fit’s Pinterest boards. Kids Fitness Ideas. Getting the kids involved in a fit lifestyle is a gift that will benefit them for the rest of their lives. Our “Kids Fitness Ideas” board is loaded with fun family-style activities to get those little hearts pumping, and those little faces smiling. Find Great Healthy Recipe Ideas. If keeping your workout routine interesting is hard, then keeping your meal plans exciting and new is nearly impossible. Luckily though, it isn’t actually impossible. All you need is a little inspiration to liven up your recipe repertoire, and you can easily find a ton of quick, healthy, family friendly recipe ideas on our “Healthy Recipes” board. Get the Inside Scoop. Don’t miss a single thing happening here at Cal Fit. When we roll out new classes, special events, or promotions, you’ll be among the first to know, and you’ll be able to repin it so you can find the details later. Keep the Kids Busy. Our “Kids Klub” board is where you can find out about all the fun things going on in our childcare programs. You will definitely work out harder, and with more focus if you are certain your kids are off having some fun of their own. Great Wellness Tips. True and complete wellness only happens when we address both the body and mind. Find wonderful tips for general wellness on our “Wellness Tips” board. Stress reduction, brain stimulation, and immune system function are just some of the useful topics you can repin for safekeeping. Stay Connected With Other Members. Other members follow us, and are encouraged to leave comments and “like” the pins that worked well for them. You can be a part of the growing community of Cal Fit Pinterest members who are already actively repinning and sharing their thoughts. You Are What You Read. Just as filling your body with junk will have negative consequences, filling your mind with it does too. Why not spend time online in a place that is filled with nurturing, positive information that can inspire, motivate, and help you reach your goals. Pinterest is addictive, there’s no doubt about it. So make sure what you’re spending time pinning is going to help you toward reaching your goals. Take a moment to follow Cal Fit on Pinterest and take advantage of the plethora of great pins we’ve already collected for you. What are you waiting for? Pin away!